Integrated sensors. smoke sensitive compound, food approved classification are just examples of safety we can build into your sealing profes. Get in touch to know more. To have quality in everything you do is one thing, being reliable in demonstrating it over time is another. With more than 100 years of experience in meeting customer expectations we look forward to being challenged by you. Throughout the production cycle we can super vice, measure and scan the surface, the shape and a tailored length providing you with a product meeting your specification. We can provide a wide range of services, you decide what support is important for your business. Whatever choice, quality is guaranteed. Our in-house design experts are part of the value we provide you with. They make sure that your solution is perfectly fitted to the application. We understand the value of the commitment you make to your customers. Our focus is to help you find a solution, and produce and deliver it on time and on budget. Your needs for testing materials, products or the application guide our work. Our manufacturing live up to norms and standards according to the certificates acquired. Ask us about tests and certificates. Hold-ups and quality issues cost money and goodwill. With Trelleborg, you’ll have a partner that takes your responsibility seriously. Get in touch to discuss your opportunities. With access to in-house mixing resources we have a material portfolio that can focus on finding the right material for your application without compromises. You can benefit from our in-house compounding capabilities and the specialist competence that gives us. Read how one of our compounders reason around mixing the materials. Does your solution benefit from material combinations or will the multi cavity profile be the best fit for your application? We are equipped to meet your needs. We can help make your offer even more competitive with ingenious material improvements that protect even better against effective vibration, moisture, temperature and particles. Do you have design requirements that call for matching the color of the seals with other parts of the application? Get in touch to talk about color. 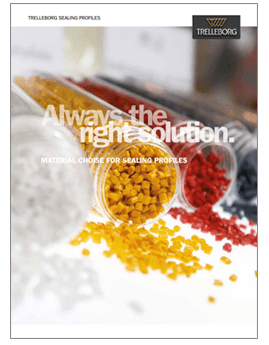 This brochure will give you an overview of polymer materials and how the properties can support your solution. You are in good hands when discussing with our design engineers. Take the opportunity to find out what this could mean for you. Functionality is a topic that opens up for many questions. You can be sure that we will ask a lot of questions. Finite Element Analysis provides the possibility to test different designs or material combinations. The output could be displayed as images, films and charts. The design evaluation when simulating a solution can cover a wide range of critical parameters. Your access to our in-house competence is part of making the development phase a safe journey. In parts of the construction with no visibility you need to relay on the functionality performed by the solutions that seal, damp and protect. Read more on how to secure your application. Did you know that we have more than 100 years of innovation in our company? Your challenges could be turned into innovations and provide added value for your customers. Read the story about a Norwegian company going big on safe solutions. What added value is on top of your list? Easy application will affect your business far beyond the product itself. Ensure you have the right input for the complete life cycle of your application. You can get your profiles marked with instructions, create product differentiation or simply making your brand stand out. Did you know that we are frame makers? You could think about leaving this part of your process to us. Take the opportunity to discuss your needs when it comes to frame making. We want to make it easy for you to compare our profiles. Have look at the new web tool. The demands on your application to deal with fire, water, energy loss or noise reduction are growing every day. Ask for our help in solving your problems. Functionality that can reduces time, reduces weight or the number of tools in your fitting process. Image the advantage you will have when accessing the whole team of dedicated specialists within Trelleborg.